Black Sea Bass are one of the first fish species to bend our fishing rods and grace our dining tables here on Cape Cod each spring, and we eagerly await their arrival! 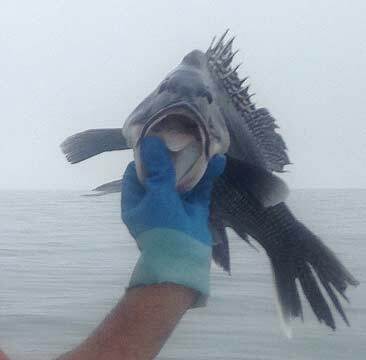 Bass in name only, Black Sea Bass are actually a northern member of the Grouper Family. Their preferred habitat is rocks, reefs, wrecks and other “structure” in water depths ranging from 30-350 feet. They grow to a maximum weight of over 10 pounds and 27 inches long (the World Record). 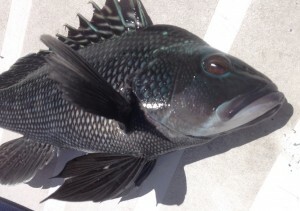 Most of the fish that we catch are in the 10 to 22 inch range, (2 to 5 pounds) but larger ones are not unusual and your help in putting a new World Record Black Sea Bass aboard the Dragonfly this season would be much appreciated. Check out our Black Sea Bass Trips and Rates. The smaller mostly black fish are females. The larger fish are males and develop a beautiful pattern of black and white and vivid blue. The largest of these males (called dominant males) develop a large bump on their heads called a nuchal hump, and have extremely brilliant color. We affectionately call these large dominant males “knot-heads”, and they are our primary target on any Black Sea Bass fishing trip. Sea Bass arrive in May chasing Longfin Squid that have come into Nantucket Sound (on the south side of Cape Cod) to breed. They are voracious predators with extremely large mouths for their size, and will attack baits, lures and jigs that are exceptionally large relative to the fish’s size. 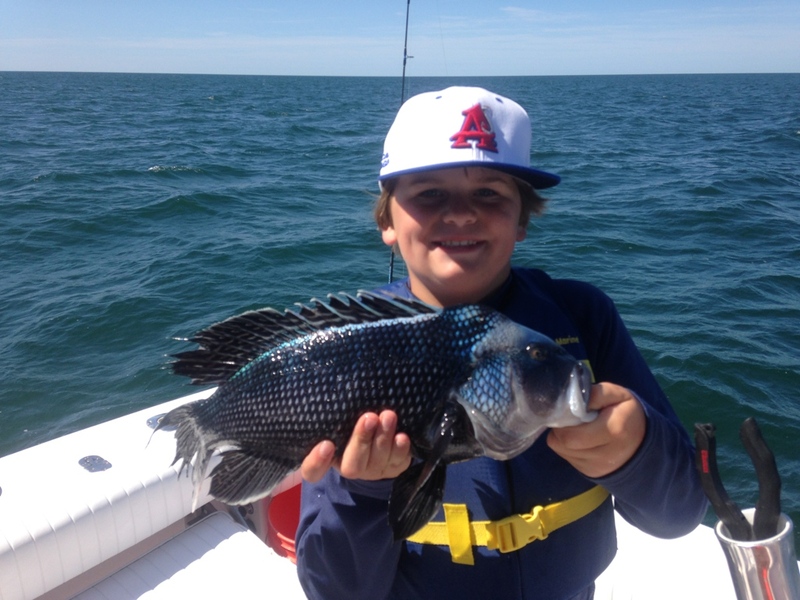 Black Sea Bass usually travel in big schools and it is not unusual for everyone on board with a line in the water to be catching them one after the other. When matched to the proper light tackle, they put up an incredible fight. The nonstop action is great fun for experienced anglers young and old, and a fantastic introduction to the world of salt water fishing for newcomers to the sport. Like their southern Grouper cousins, Black Sea Bass are excellent eating. Much sought after commercially and recreationally as a food fish, Black Sea Bass are prized by chefs for their light, flaky white flesh and extremely delicate flavor. Smaller fish are usually cooked whole (the preferred presentation of finer restaurants). Larger fish can be filleted if desired. 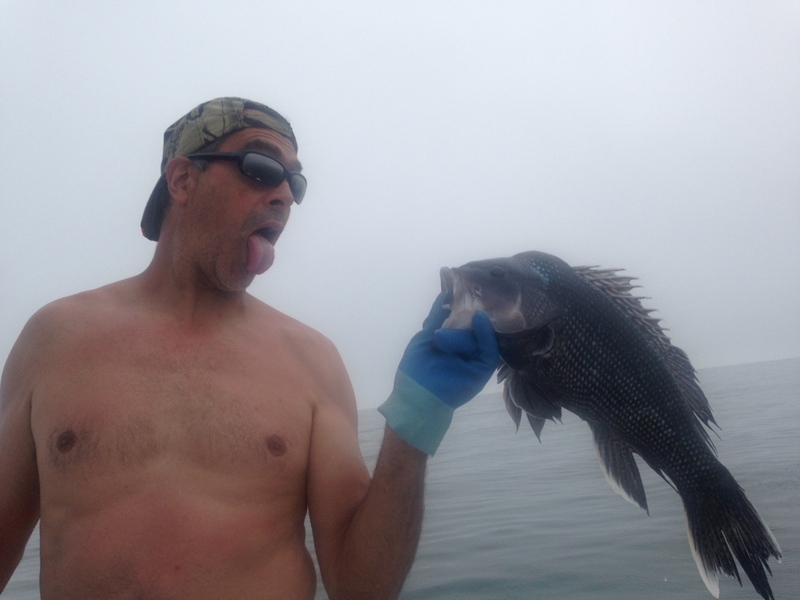 Many Cape Cod fishermen will agree that Black Sea Bass is the finest eating fish our waters have to offer. 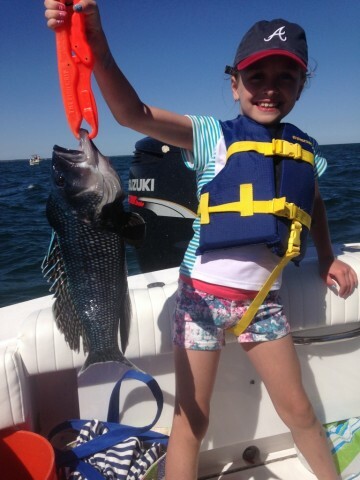 Black Sea Bass Charters aboard the Dragonfly depart primarily from the Bass River Beach (Smugglers Beach) in South Yarmouth, MA. The launch is situated at the very end of the Bass River, giving us immediate access to the waters of Nantucket sound. There are several man-made reefs and multiple rock piles that provide ideal Black Sea Bass habitat within very short cruising distance. The short travel distance makes for more fishing time on your trip and an easy ride. Jigging for Black Sea Bass is one of my favorite things to do and I never tire of the hard strikes and fierce battles these brawlers provide. 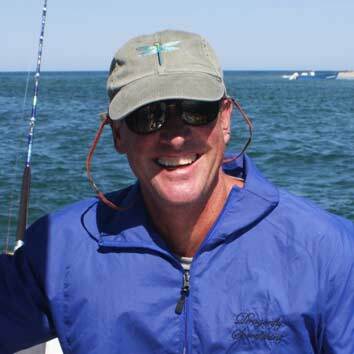 You don’t have to wait for the Striped Bass and Tuna to arrive to have a great fishing trip. 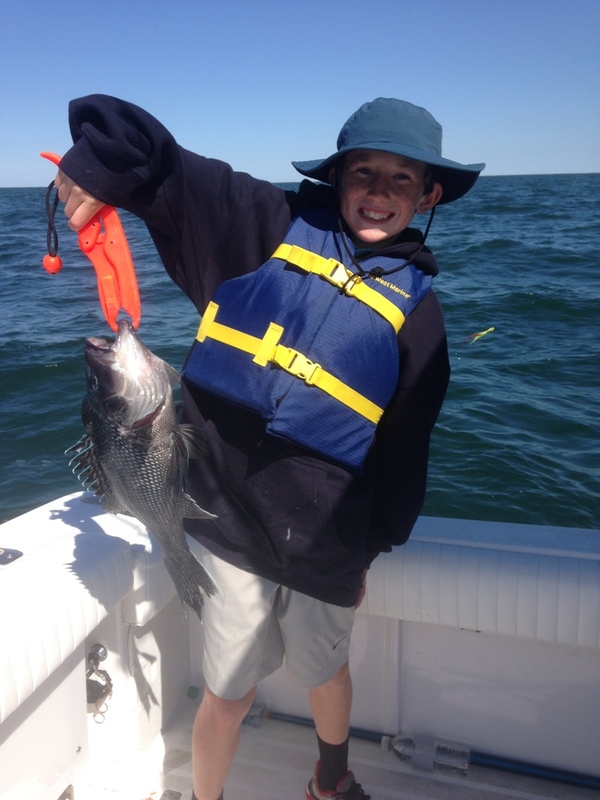 Come and enjoy the best spring fishing and eating on Cape Cod; Black Sea Bass. 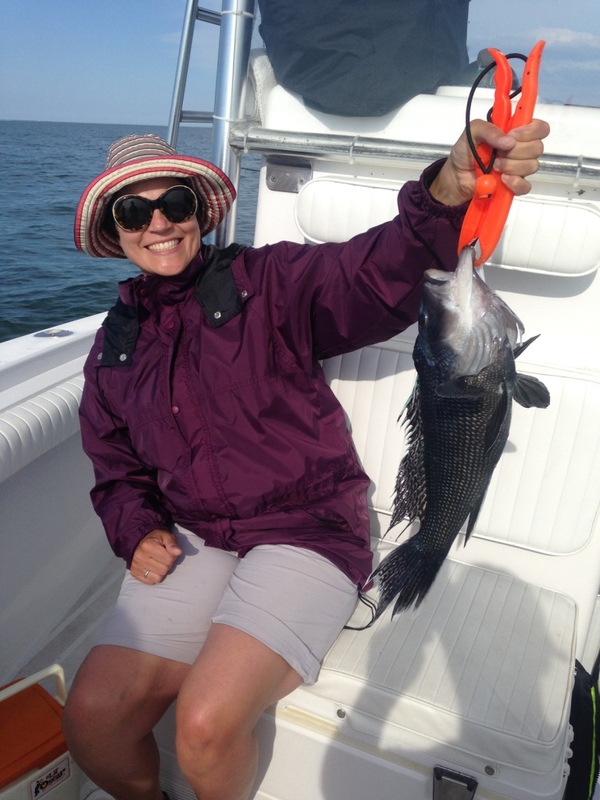 Check out our Black Sea Bass Trips and Rates.